On the two-year anniversary of Superstorm Sandy, utility executives remember the surprises they faced. Two days later, Hurricane Sandy was born. Masters certainly knew what trouble meant. Thirty years before, he started his meteorological career as a hurricane hunter in Miami, Florida, flying into Category 5 storms at the speed of a Formula One race car. In 1989, Masters was almost killed when the engine of his plane caught on fire as it soared into the eyewall of Hurricane Hugo. The pilot lost control of the aircraft, diving down the calm side of the eye toward the Atlantic. With only 900 feet left before crashing into the ocean, his pilot regained control, steadied the plane and maneuvered it out of the 140 mph winds to safety. That was enough to scare Masters into going back to school, completing a doctorate in meteorology, and trying something less dangerous. Rather than traveling directly into extreme weather, he started writing about it. In 1995, Masters and a small team at the University of Michigan founded the first commercial website devoted to weather called Weather Underground, spawning a new era of online meteorology reporting. On October 24, 2012, just a few months after his site was acquired by The Weather Channel, Masters was busy writing about the formation of Hurricane Sandy on his popular meteorology and climate blog. That year had already tied for producing the third-most named storms in history, so there was plenty to write about. Masters was particularly interested in this new storm gathering intensity so late in the season. Any time a storm system builds in the warm waters of the deep Caribbean, its potential to become a major hurricane drastically increases. Masters followed Sandy as it looped over the Caribbean Sea, morphing from a tropical depression into a tropical storm, and finally into a hurricane with 80 mph winds. And with nowhere to go but land, Sandy was headed straight toward Jamaica and Cuba as it sucked up energy from the warm ocean. “It was immediately obvious it was going to be trouble,” said Masters. That evening, Sandy grazed Jamaica, cutting power for 70 percent of the island. It then moved offshore and grew into a Category 3 hurricane before hitting Cuba head-on, completely destroying 24,000 homes and leaving more than 1 million people without access to clean water or energy. It was a harbinger of destruction to come. But most Americans outside of meteorology circles were only starting to take Sandy seriously as a threat. The issue, wrote Masters on his blog, was that the long-range forecasts were “clear as mud.” In the days leading up to Sandy’s initial formation, numerous computer models showed the storm harmlessly moving out into the Atlantic Ocean or grazing the Mid-Atlantic coast of the U.S. But one model, from the European Center for Medium-Range Weather Forecasts, predicted Sandy would make direct landfall on the East Coast near Delaware. Photo Credit: Weather Underground. 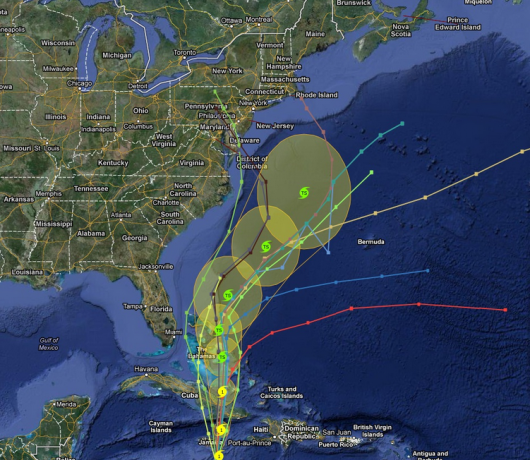 Conflicting long-range forecasts for Hurricane Sandy. It would take another few days after Sandy reached hurricane status in the Caribbean before the other models started matching up. With so many contradictions, few people, including Masters, could then fully imagine the confluence of factors that would turn Sandy into a “superstorm” with the largest area and most kinetic energy on record. “At that moment, I certainly didn’t foresee the interactions that led to the kind of destructive power it had,” said Masters. It wouldn’t take long before he did. Over the next two days, as Sandy pushed passed the Bahamas and moved further north into the colder waters of the Atlantic Ocean, the tone from meteorologists changed dramatically. Although Sandy had lost a bit of intensity, it was headed straight for the Gulf Stream where waters were 2 ̊C warmer than average. That allowed it to maintain hurricane strength and expand to an area 1.5 times the size of Texas, a remarkable occurrence so late in October. At the same time, a strong high-pressure system over Greenland created a “block” that prevented Sandy from moving further east into the Atlantic, slowing its advance and putting it directly in the path of a winter storm moving across the continental U.S. The combination of weather systems had created the conditions for a record-breaking storm. By October 27, most of the forecasting models were showing a probable hit to the most populated area of the U.S. around New York and New Jersey -- just when the tides were at their highest. That day, President Obama held an emergency meeting with top national security and federal emergency response officials to talk about a worst-case scenario. But with doubts lingering over how far west Sandy would turn, the National Hurricane Center held off on issuing a federal advisory. It was, by all accounts, a superstorm. Long before Ralph Izzo became CEO of New Jersey’s largest utility holding company, PSEG, he was a research scientist at a Princeton laboratory running numerical simulations for experiments on fusion energy. Along with knowing how to run a large energy company, Izzo happened to be skilled in computer simulation as well. A week before Sandy made landfall, Izzo sat down to his desk at PSEG’s headquarters in downtown Newark to monitor the conflicting computer models tracking the storm. He was interested in the variances in weather prediction both out of personal curiosity and for business reasons. Izzo was, after all, in charge of ensuring a reliable supply of energy for 4 million gas and electricity customers throughout New Jersey. One model from England stood out. It was the same one that caught Jeff Masters’ attention, generated by the European Center for Medium-Range Weather Forecasting. While the U.S. models predicted Sandy would move safely to the east and get dismantled by the cold ocean, the European model showed a westerly track toward the Eastern Seaboard. Izzo found it unusual and hoped it was just an outlier. The mood at PSEG’s headquarters was still calm, but alert. In the underground control room, computer screens monitored transmission lines and the distribution network. Television screens silently played news reports and weather updates. Some put on headphones to listen to the televisions; others compared notes about what they thought would happen. It was still unclear what path Sandy would take. Photo Credit: PSEG. 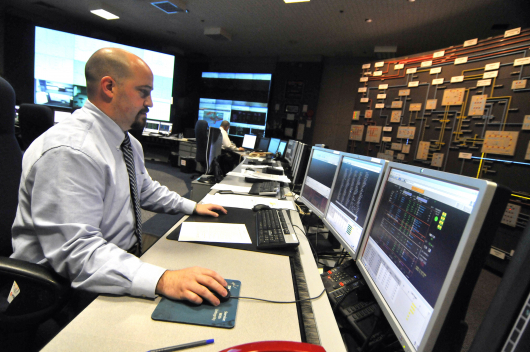 A PSE&G employee monitors electric system operations. Engineers in the control room took stock of field operations. The situation was normal: the occasional pole down from heavy winds or a car accident, a few extra tree-trimming jobs being conducted around wires, and some maintenance work on substations. Knowing exactly how many jobs were being worked in the field -- and why -- was critical for understanding if there were any vulnerabilities during a major storm event. Since Hurricane Irene in August 2011, PSEG had replaced older transmission lines, spent $28 million on tree pruning to protect wires and circuits serving local homes and businesses, and improved its automated calling system. Izzo felt prepared. But a strong hurricane would always be a problem for the grid. While hardening efforts could help prevent outages, the crucial indicator of a utility’s performance would be how quickly it brought power back to those who had lost it. On October 28, the calm started to break. The Europeans were correct. Sandy was on its way to New Jersey, and it was increasingly looking like a direct hit. Finally ready to mobilize federal agencies for a worst-case scenario, President Obama signed an emergency declaration for five East Coast states, including New Jersey. Public Service Gas and Electric (PSE&G) the utility run by parent company PSEG, called in more than 1,300 lineworkers from around the country to assist with preparation and storm response efforts. Plans were made to staff the call center with as many people as possible. And a warning was issued to customers to be prepared for outages and emergency evacuations. The following morning, October 29, Izzo left home and did something he hadn’t done before: packed an overnight bag. If the models were even half right, he told his wife, he shouldn’t be expected home for a couple of days. He immediately went to his desk to monitor the weather models. There were no outliers any more. Izzo and his team immediately launched the Delivery Emergency Response Center into operation. Located in a bunker underneath PSEG headquarters, DERC is only opened during major events. It features its own backup generator, a kitchen and a stash of portable air mattresses for the inevitable overnight stays. It had been opened numerous times in the last eighteen months for extreme weather events, including Hurricane Irene, which had caused what at the time was the worst series of outages in the utility’s history. The engineers responsible for monitoring Sandy knew they would likely be sleeping in that underground room for more than one night. That evening, Izzo sat down with the utility’s president, Ralph LaRossa, as Sandy -- now a post-tropical cyclone -- closed in. It was clear that New Jersey was in for a hard hit. At 6:30 p.m., however, the storm wasn’t as strong as the two men expected. “Ralph, I think we dodged the bullet,” said Izzo. LaRossa agreed. Perhaps the forecasters had gotten it wrong after all. But two hours later, as Sandy continued its hard left turn toward the abandoned Atlantic City boardwalk, it was clear that no one had gotten it wrong. “By 8 p.m., the world as we knew it had come to an end,” said Izzo. In a matter of hours, 85 percent of PSEG’s customers had been cut from the grid. When Pat Mullin left home to prepare her storm restoration team on the morning of October 29, she was aware of what could be coming for her coastal town of Toms River, New Jersey. Mullin, a 26-year veteran of the utility workforce who had seen plenty of storms, was still unsure whether she should evacuate her family. The summer before, she and her husband Bob moved their two children away from the coast to avoid Hurricane Irene. That storm hadn’t been a direct hit, and their home was spared any major damage or flooding. Mullin wondered if Sandy would take a similar track. She decided to stay home and ride it out. 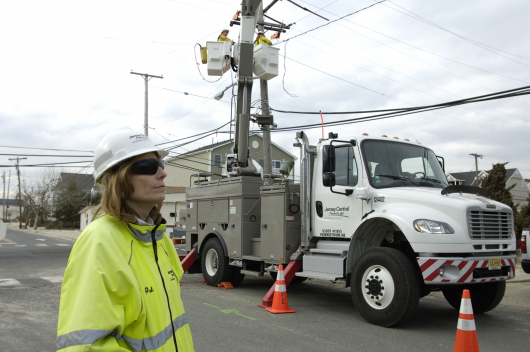 Whatever the coming storm’s exact path, it was clear Sandy would be an important test for Mullin and her company, Jersey Central Power & Light (JCP&L), a utility serving more than 1 million customers throughout the state. JCP&L had a lot to prove when it came to storm response efforts. Ten months earlier, regulators had released a report criticizing the utility’s response to a pair of devastating weather events in 2011: Hurricane Irene and an early-winter nor’easter. Photo Credit: FirstEnergy Corp. JCP&L’s Pat Mullin overseeing restoration efforts in New Jersey. With 750,000 outages in its territory during Hurricane Irene, JCP&L had taken a bigger hit than any other utility. Some outages lasted for up to eight days, even as other utilities had reconnected all of their customers. The state’s Board of Public Utilities singled out JCP&L for its inconsistent communication with local officials, inaccurate restoration estimates and slow requests for outside help from other utilities. And then, in less than a year’s time, another record-breaking storm was on its way to test whether that additional work had been done. 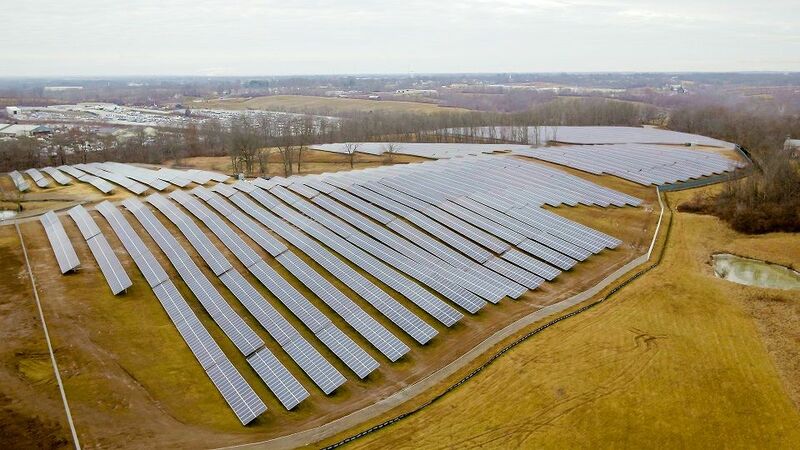 In Trenton, an hour’s drive northwest of where Mullin was stationed, Tony Hurley flew in from Ohio to represent the utility at the Regional Operations and Intelligence Center (ROIC). Hurley was director of operations services at Toledo Edison, another utility owned by JCP&L’s parent company, FirstEnergy. He was there to meet with state regulators and officials from the Department of Energy, the Federal Emergency Management Agency (FEMA) and the Army Corps of Engineers. Utility officials understood the potential consequences of the coming storm, and they were out to show improved coordination. For the next twelve days, the ROIC would be Hurley’s home base where he would stay in close contact with the military, state officials and utilities supplying workers from around the country. Mullin was one of the regional managers responsible for securing resources needed to get electricity flowing after any major disruption. Her territory covered the barrier islands along New Jersey’s coastline, some of the most iconic -- and vulnerable -- communities in the state. Operating from a trailer on the side of New Jersey’s Route 35, Mullin worked to secure cleanup equipment, get hotel rooms for utility crews visiting from the West Coast, work with emergency response officials and manage on-the-ground operations. It was a challenging job that had her coordinating a lot of moving pieces, but she loved it. A few hours after settling into her rhythm, Mullin got a call from her husband. The fire department was strongly urging them to evacuate in preparation for Sandy. Their neighbors were leaving as well. Mullin urged Bob to pack some bags and bring the children to a friend’s house a few miles south, farther from the coast, thinking they’d stay away from home for only a night. Assured that her family was safe, Mullin did the only thing she could do: continued following protocol and preparing for a storm she hoped wouldn’t be as bad as predicted. Sandy’s winds, rain or scale weren’t the biggest concerns for Kevin Burke. It was the storm coming in at high tide that made him most nervous. Then the CEO of Consolidated Edison, a utility serving more than 3 million electricity customers around New York City, Burke was responsible for the world’s biggest underground network of power- delivery equipment. With twelve-foot surges expected to inundate low-lying areas of the city, Con Edison engineers understood that Sandy would push the limits of what their system could handle. That system is immense. Buried beneath New York City’s streets is a complex network of transmission and distribution wires, transformers, and gas pipelines. The web of cables operated by Con Edison is so extensive -- amounting to 94,000 miles in length if uncoiled -- it could wrap around the world more than three and a half times. 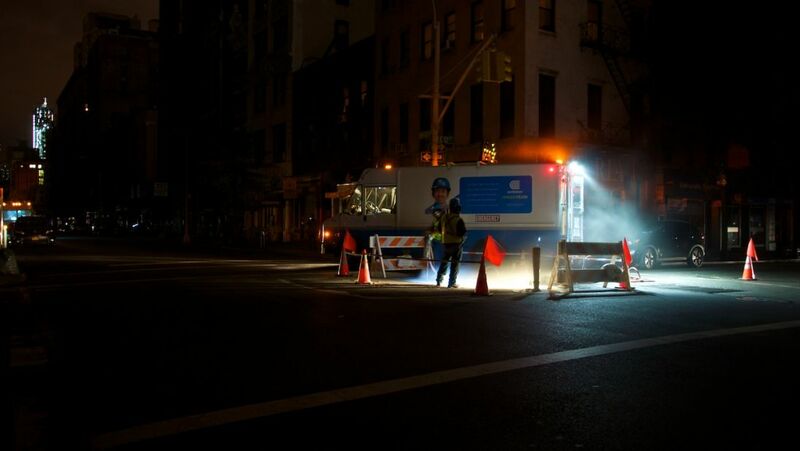 Photo Credit: Con Edison. 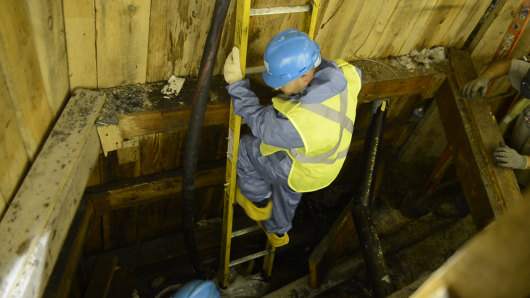 A Con Edison engineer climbs underground to work on a feeder line. 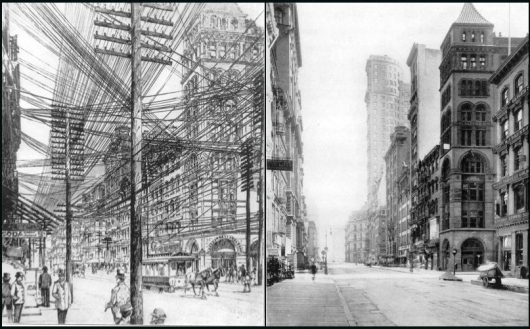 The origin of New York City’s underground wiring system dates all the way back to the beginning of commercial electricity itself. In 1882, when Thomas Edison built the first series of steam power plants in the city and connected them to buildings through a copper wiring system, he decided that burying the lines was safer than stringing them overhead. Most of Edison’s subsequent commercial power projects throughout the Northeast were built in the same way. 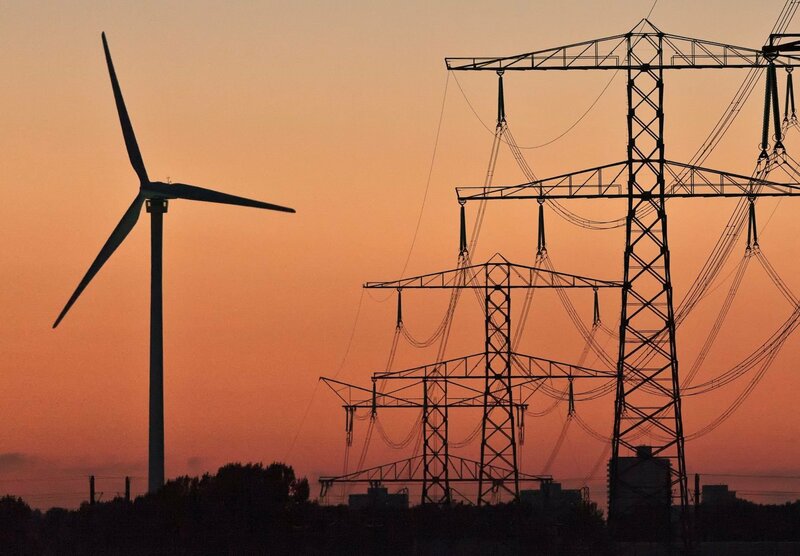 But as more power companies received licenses to operate in New York and the electricity market grew more competitive, operators started putting lines overhead in order to speed up electrification. By the late 1880s, the streets of Manhattan had transformed into a dense plantation of wooden poles covered in a thick web of copper wires. It was a historic snowstorm in 1888 that helped make New York’s electric system what it is today. In March of that year, the city was hit with a nor’easter that brought 21 inches of snow in Manhattan and 36 inches in Brooklyn. Within hours, the flourishing electricity system collapsed on itself, blacking out the city for days. Electrical poles snapped under the weight of the crisscrossing wires. Residents were warned not to walk in the streets due to risk of electrical shock. And local politicians expressed outrage at the lack of planning. “The poles will come down,” declared Hugh J. Grant, New York’s newly elected mayor, months later, in an effort to put the grid underground. As early as 1884, New York officials had been trying to force companies to bury their lines. Snapping wires, block-wide outages and electrocutions were frequent problems for the crowded above-ground electricity system. But companies successfully challenged local ordinances in court, avoiding any changes. 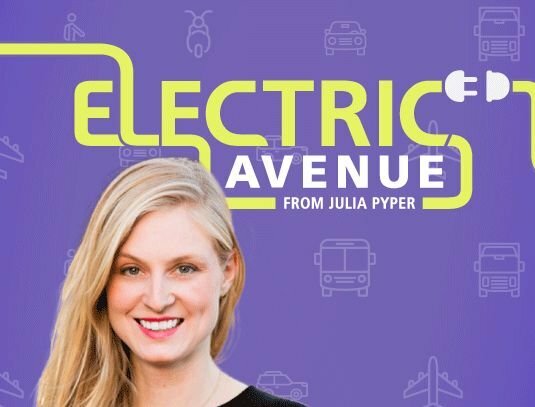 In the years after the 1888 storm -- which brought numerous accidental electrocutions on the streets -- the courts finally demanded that electric companies follow local laws. By the 1890s, large portions of the vast tangle of copper and wood had been placed underground for good. Photo Credit: Old York Foundation. New York’s flourishing electricity network in the 1880s. After more than a century of consolidation and regulatory reform that whittled down the number of electricity companies in New York, Con Edison eventually emerged as the controller of all that underground equipment -- helping deliver electricity from other competitive suppliers to the $19 billion energy market across the five boroughs in the city. Today, about three-quarters of Con Edison’s electricity system is buried. Having such an intricate network of equipment below ground protected Con Edison’s system from winds and more conventional storms. But the ocean -- the salty, corrosive, dirt-laden water brought by storm surges during hurricanes -- had always been the real threat to the utility. And Sandy’s landfall directly at high tide was going to bring the biggest storm surge Con Edison had ever seen. “We knew that the big issue we had to concern ourselves with was the storm surge,” said Burke. Twelve-and-a-half feet. That was the number in the minds of employees at Con Edison. If the storm surge stayed below that level, Con Edison’s critical substation in lower Manhattan -- a piece of equipment on 13th Street that keeps one-third of the borough powered -- would be safe. No storm surge previously recorded had ever hit that level. By the night of Sunday, October 28, Burke had already been on three press calls with Mayor Michael Bloomberg to brief the public on storm scenarios. 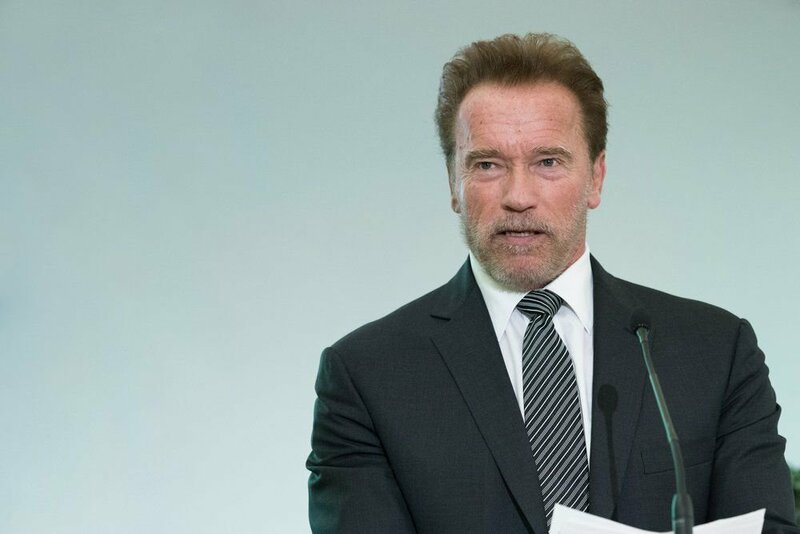 He was blunt: the power company would need to preemptively shut down two networks in Manhattan and one in Brooklyn to avoid serious damage to equipment. It was a precautionary measure started in the early 1990s, when a storm surge destroyed equipment that hadn’t been powered down. But the operations team decided not to cut the 13th Street substation, thinking the 12-foot barricade would keep it safe from the threatening ocean. Burke went home that evening, feeling comfortable that his company had its response plan and that the emergency center was fully staffed. After a weekend of preparation, it was time to take a breather before the storm rolled in. Later that night, President Obama finally signed an emergency declaration for New York and New Jersey as the superstorm closed in. The floodwaters were already rising around the edges of the city when Burke got back to the office on Monday morning. Bridges, schools, public transportation and the New York Stock Exchange were all shut down. But the backbone of the city -- electricity -- was still working as usual. By late afternoon the wires, poles and transformers above ground came under threat. The winds were fierce. In midtown Manhattan, a construction crane 75 stories tall had been ripped loose and was swaying dangerously over the streets. Images of the crane played on a television screen in Con Edison’s auditorium, where emergency teams watched news and weather reports. If a steel crane was that vulnerable to the storm, the electric system was in for a pounding. At 4:45 p.m., Con Edison reported nearly 69,000 outages. An hour later, Michael Bloomberg called Sandy “the storm of the century,” and warned New Yorkers that peak flooding had yet to come. The outages spiraled quickly after that. Over the next two hours, 70,000 more Con Edison customers lost power. With water rushing into the city, Burke finally made the decision to power down substations in Manhattan and Brooklyn, cutting off electricity for tens of thousands more people. At around 8:30 p.m., just as storm surges neared their peak, Burke jumped on the phone with the mayor’s office to provide an operational update. Minutes later, looking out the window as he talked, Burke witnessed his company’s most catastrophic event: a cascading power outage across lower Manhattan. Suddenly, the lights went out in his office. “At that point, I knew we had lost another couple of networks,” said Burke. Another 200,000 people were cut off. Photo Credit: YouTube. 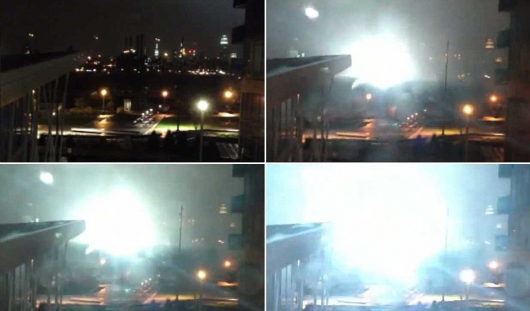 A videographer captures an electrical arc at Con Edison’s substation. The worst-case scenario was worse than Con Edison imagined. A 14-foot storm surge -- nearly two feet higher than expected -- had inundated the 13th Street substation, causing an electric arc. Within minutes, a YouTube video had been posted showing what looked like a bomb exploding at the location from miles away. When the flashes of light finally sputtered out after 30 seconds, the buildings in the background were dark. “It hit like nothing we had experienced before -- nothing that we even could have anticipated,” said Burke. It wasn’t just catastrophic equipment failure that Burke had to worry about. He also had eleven engineers trapped in the flooded substation where the arc had just occurred. Before power restoration efforts could begin, Con Edison had one mission: get its eleven-person crew out of the flooded substation. As the rain and wind battered the city, an electrical engineer familiar with the building met up with two firefighters. They rafted through the waist-deep water in the street to the entrance of the brick building, and managed to open the door. Inside, ten employees were huddled in safety on the second floor; one was on the first floor atop a filing cabinet. Luckily, there were no fires. But 4 to 6 feet of water inundated the control room and substation equipment, shorting it out. The next morning was when the real work began. Download the rest of the free free e-book today.